When you act illogically, people say you’re on “crazy pills.” When you act foolishly, they ask, “Did you take stupid pills this morning?” But when you’re really on your game, express yourself eloquently, or have a creative stroke of genius, nobody ever accuses you of being on “smart pills.” That’s because, of course, smart pills don’t exist. Nothing is going to make you into a genius overnight, but what if there really was something you could take that could fire up your brainpower, enhance your ability to store and recall information, and put you into a flow state so that you could do your best work without distraction? The nootropic Alpha BRAIN is that something, and clinical research shows it. In 2016, the results and methodologies from Alpha BRAIN’s clinical trial were accepted and published by the Journal of Human Psychopharmacology: Clinical and Experimental. The study was randomized, double blind, placebo-controlled, and conducted by the Boston Center for Memory. It assigned 63 participants to take either one serving of Alpha BRAIN or a placebo for 45 days. Subjects were evaluated before and after the supplementation period using validated neuropsychological assessments. “The target demographic we were looking to enroll was exactly who [the product] was being marketed to,” says Todd Solomon, Ph.D., the trial’s director. Specifically, healthy 18 to 35-year-old males and females with above average educations and IQ scores. “More than 50% had a bachelor’s degree or some college,” says Solomon. The subjects were split into two groups. One was given two capsules of Alpha BRAIN (the same recommended dosage Onnit prescribes to customers) while the control received a placebo. Both groups were then put through a battery of different neurocognitive tests. The evaluations looked at different aspects of cognition, from verbal memory to visual memory, short- and long-term memory, executive functioning, processing speed, and attentional tasks. “We tried to isolate different areas of cognition,” says Solomon. “The verbal memory tests had to do with being able to remember a list of words after a short and then long delay.” The visual memory tests had the subjects look at shapes and then try to recreate them from memory later on. To test their attention, the men and women were given maze puzzles to solve and arithmetic problems. “These are all well-known, well-validated neuropsychological tasks,” Solomon says. There were no noticeable differences in cognitive performance between the two groups at the beginning of the study. After 45 days, both groups showed improvement, but gains in the Alpha BRAIN group were statistically more significant than the placebo. No significant side effects were reported in either study group, and study compliance was high, indicating overall good tolerability with daily Alpha BRAIN use. Furthermore, there were no differences in sleep quality between the two groups. In addition to the neuropsychological assessment, a compelling biomarker was added to the study protocol. A subset of the subjects were recruited to participate in electroencephalographic (EEG) brain recording—a measure of brain activity. The recordings were done at three different times: baseline, one hour after the subjects’ first dose, and after the full 45-day study period. This way, the brain activity from a single dose could be compared to prolonged supplementation. 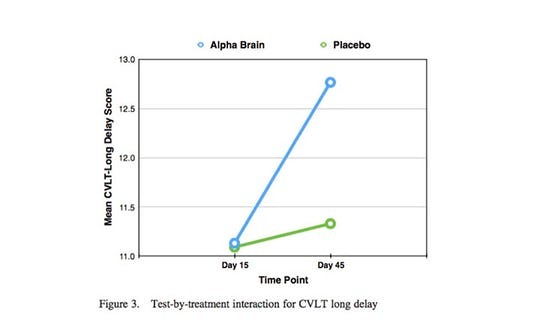 Remarkably, those taking Alpha BRAIN exhibited statistically faster processing speed and greater response detection amplitudes after both a single dose and at 45 days compared to their placebo counterparts. This data was presented separately and recently published as an abstract in Alzheimer’s & Dementia: The Journal of the Alzheimer’s Association, available HERE. Onnit’s contribution to the scientific literature sets a precedent for the nutritional supplement industry. The data has attracted the attention of various researchers with new scopes of study, such as the US Army and the Alzheimer’s Association. Onnit will continue to fund research that is valuable to both consumers of Onnit products and the larger scientific community. Who Can Benefit From Alpha BRAIN? Most people consume coffee to heighten their focus and alertness, but many can’t handle the side effects. Because Alpha BRAIN is not a stimulant, the jitters and anxiety that often accompany caffeine use don’t apply. 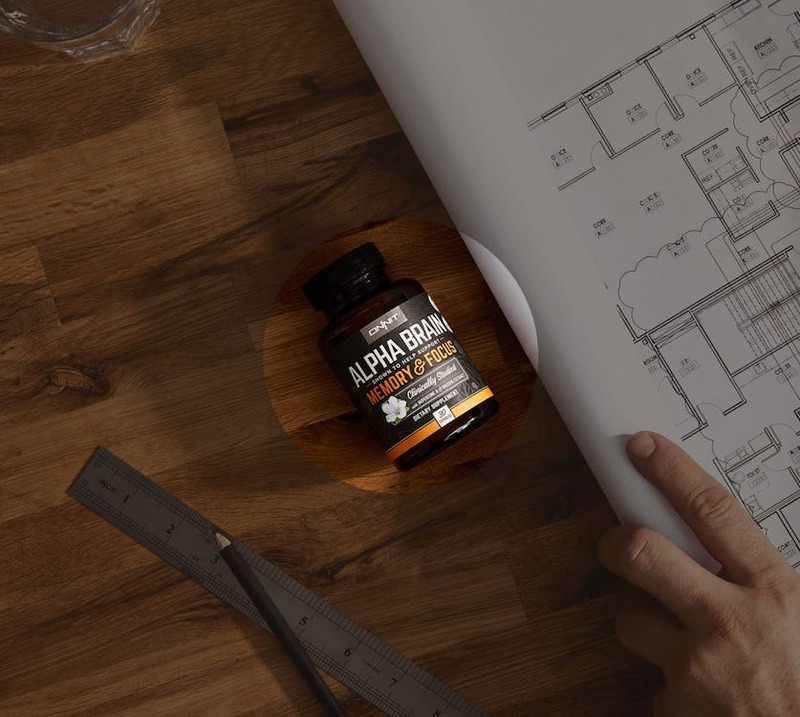 If you’ve been looking for something to replace coffee in your morning routine, or at least help you cut back on it, Alpha BRAIN could be your substitute. And you won’t need nearly as much of it to get the desired effects. While you may require two or more cups of coffee to feel like yourself, the brain scans showed that Alpha BRAIN took effect with a single dose. It’s not habit-forming either. Since Alpha BRAIN was specifically shown to help subjects recall words, it’s a no brainer that you should take it before studying for any test that has a language component (say, the SAT’s? ), and then again before taking the exam. The same goes if you’re giving a speech or a presentation. If you usually find yourself getting tongue-tied (especially in front of large groups of judgmental eyes), Alpha BRAIN can help you find the right words without a lot of pauses and “ums” in between. If you’re a writer, musician, or other creative type, you know how frustrating it is to get in “the zone” and then have your concentration shattered by some interruption—be it cars outside your window or even your own wandering mind. Alpha BRAIN promotes flow states, so you can buckle your mind down and keep the creative juices flowing until your project is complete. Alhpa Brain has similar ingredients that Phenibut has. You would only know this is you are a chemist or a psychologist/rehab doctor. These products have NOT been approved in the United States as a form of treating depression, anxiety, or giving a calming effect. Doctors around our country are seeing an increase in rehab centers of people who have taken this dangerous substance. The issue comes when they try to stop taking the substance. First of all this substance is highly addictive. Over time, staying at the same dosage is impossible and you will have to increase the dosage to get the same effect. Second, it is NOT a natural vitamin or a natural supplement. It has ingredients similar to Meth and can cause hallucinations and a change in your personality when you try to quit. It destroys your dopamine receptors, making you feel depressed if you try to stop taking the substance. I am making it one of my missions to raise awareness. As a result, my sister is in the hospital because of this substance. She used this product for over a year. The scientific study that you use as a reference only lasted for 6 weeks. Has any research been done with Alpha Brain and dementia? This entire web site is a clearinghouse for crap. Eat clean, mix weightlifting and cardio, get your sleep and read a book with an open mind. This human optimization nonsense is in nobody’s interest but for the financial gain of the people selling these products.